Posted from the 2014 story. Happy Mother's Day to all of our Ragin' Cajuns Mothers. 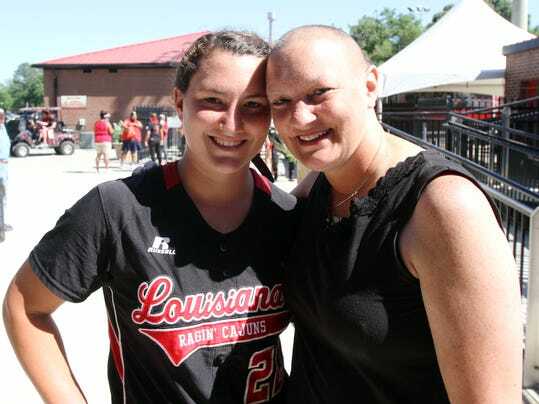 On this Mother's Day, the AN honors one very special MOTHER, a former USL Volleyball player, and her young daughter who is currently a member of the Ragin' Cajuns Softball Team. Our salute is to Debbie Boullion Landry and Shellie on this special Mother's Day. They exemplify the strength of the family and confirm the value of the Family Connections Page in the History of UL Athletics on this website. Watch the video of Shellie's Magical Moment, the grand slam walk-off home run to win the first Cajuns game on Thursday and view the photos of Debbie's 1988 Volleyball Team. This story posted again on May 11, Mother's Day, so we could bring Debbie and Shellie's story to the forefront. Cancer battle strengthens bond of UL softball player's family passions. The Landry family was already doing that. In other words, cancer may have picked on the wrong family on Oct. 17, when Debbie Landry received the news. Now that eight rounds of chemotherapy are behind Debbie and the words "cancer-free" are being tossed around as a true testament of faith and courage, Mother's Day 2014 will be very special for the Landry family. And yet, Debbie's hopes are that it be very much like any old Sunday afternoon. "It will be special, but really, I just want some sense of normalcy back," Debbie said. Normal for the Landry family is busy, running from game to game and practice to practice, constantly trying to be the best at every pursuit. This year, Debbie wants nothing more than a casual afternoon of sitting around the pool with family and friends, just enjoying life. Debbie, who teaches part time at St. Thomas More, was the consummate team-mom throughout her daughters' athletic careers. Shellie was a two-sport star at STM and is now a sophomore outfielder on UL's No. 12-ranked softball team. Jaime is a three-sport standout at STM and has already signed to join Shellie with the Cajuns. The youngest, Courtney, is a sophomore volleyball player at STM. Their father, Wayne, by the way, is the proud dad of three "Daddy's girls," as Debbie freely admits. When the diagnosis came in October, Debbie didn't immediately tell Jaime. She wanted to finish out her team-mom duties for STM's volleyball season, knowing that she would have to miss so much of Jaime's senior softball season, as well as Shellie's sophomore season with the Cajuns this spring. Not that she didn't push it to the limit. Debbie made "about half" of Shellie's home games and it wasn't uncommon to find Debbie in her car in the parking lot at STM watching Jaime play through the outfield fence "with a Coke nearby to try to make it through the game." 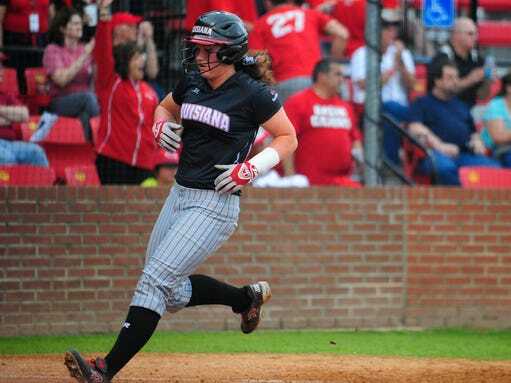 Wayne had to put his foot down to keep her from attending Shellie's huge home series against South Alabama at Lamson Park on April 12 and 13. "I was so upset," Debbie said. "But Wayne said, 'You just had major surgery. You just can't go.' "
And yet 10 days later, she was driving to Waco, Texas, to watch Shellie and the Cajuns sweep a doubleheader over Baylor after begging her doctor to approve the trip. To a mother like Debbie, missing these precious moments of her daughters' athletic careers was in many ways worse than the pain she's endured fighting cancer. For Shellie, it was a frightening reminder. Her grandfather, Thomas Boullion, died of leukemia two years ago Saturday, just before Shellie began her college career. He was a big reason Shellie decided to play at UL. She wanted him to be able to watch her play. He never got that chance. And now her mother, who had been a constant presence at all her games, wasn't there either. Mother and daughter have always been extremely close. "As a parent, you hesitate to call your kids your best friends, because you have to be the parent, but really my daughters are my best friends," Debbie said. "Shellie and I talk at least twice every day, in the morning and at night. When she left home, it was my like my right arm was missing." Shellie also struggled with the separation during her mom's ordeal. "I wanted to be there every second with her," Shellie said. "She was always on my mind." For Shellie, juggling school as a straight-A student and being a softball star had never been a problem. Suddenly, there was another priority in her mind. "I would be sitting in class thinking, 'I want to be taking care of my mom,' " Shellie said. Mom, who had always been the one demanding straight A's and all-around excellence, began consoling Shellie and "sha-shaing" her daughter's rare stumbles. "It was great having her live so close to us, but finally I had to tell Shellie between the classwork and softball that she just couldn't keep doing this to herself," Debbie said. "I told her that I was going to keep fighting and that I was going to get better. I never planned on dying. That never entered my mind. I have way too much to live for." For UL softball coach Michael Lotief, Shellie's struggles hit close to home. Diagnosed with throat cancer in 1983-84 as a sophomore in college, Lotief was familiar with what she and her famly were going through. "I have so much respect for Debbie," Lotief said. "That's a warrior right there. The way she embraced the fight. The way she allowed her kid to chase her dreams and to stand behind her kid in the middle of her own fight is so selfless." Debbie remembers one particular day that was especially hard on her and Shellie. Lotief noticed and gave Shellie permission to miss practice. "He told Shellie, 'Go be with your mom,' " Debbie said. "I thought that was so classy of him." The truth is that Lotief wishes he could have done even more. "Shellie wanted to be with her mom (all the time)," he said. "I felt for Shellie every day. The strength of that family is so inspirational. It's such a close family. It's a great story. There's so many lessons to be learned by how they fought and embraced this illness." No one will ever know how these emotional conflicts impacted Shellie's sophomore softball season. Known as a power hitter, Shellie didn't hit her first home run until the second half of the season and finished the regular season with three. Overall, however, a second-half surge left her at .291 with 10 doubles, a triple, three homers and 33 RBIs to earn her first-team All-Sun Belt recognition as an outfielder. "No, she didn't have the power numbers this year, but she did her job," said Debbie, who remains ready to argue with anyone over the use of the word "slump" to describe Shellie's season. "(Teammates) Lexie (Elkins) and Haley (Hayden) took care of the power for her this year." Through her struggles at the plate and in the classroom, Shellie naturally wanted to do what she always did — share everything with her mother. At times, however, that natural place of refuge no longer felt like the fitting option. "I didn't want to put any more pressure on her while she was sick," Shellie said. "But sometimes, I'd go home and we'd just cry together." Most of those struggles are behind them now. The chemo sessions are over. On Thursday, Shellie hit a grand slam walk-off home run to advance her team in the Sun Belt Tournament. But Debbie knows the fight hasn't ended. For one, there's another surgery coming in July — "more of a cosmetic thing." There are physical and emotional scars, and Debbie is still easily exhausted. But a family that was already filled with strong, energetic high-achievers is even stronger, even closer and even more accomplished. "We're definitely stronger," Shellie said. "I'm definitely a better person now. It's definitely brought our family even closer. I know all of that is true, but if you would have told me that I had to go through all of that to be stronger, I would have wanted an easier route to becoming a stronger person." "I guess I could have just done nothing but feel sorry for myself and just wallowed in my pain," Debbie said, "but that's not who any of us are in this family." Athletic Network Footnote: Debbie Boullion Landry was a USL Volleyball Player in 1987 & 88. Click here for the 1988 Volleyball Photo Gallery. Debbie is in the top row, 6th from the left. Please click here for her profile.